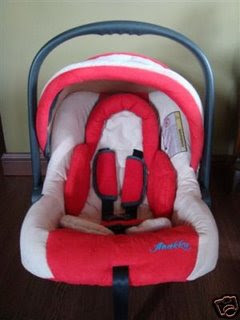 We bought this Maxi-Cosi Priory XP Car Seat in KL when Shern was only a few months old back in 2009. This car seat is for child age 1. 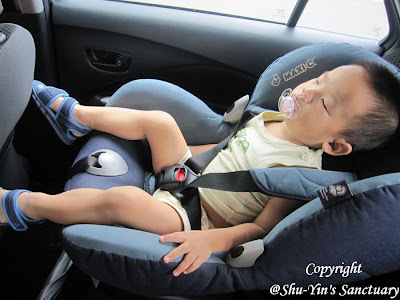 At that time, we were still using the Anakku Infant Carrier Car Seat. 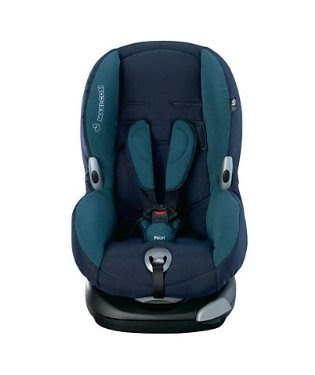 The reason we bought it because I was so adamant that car seats are of topmost important in safety-wise in a car. And we that KL has more choices than Penang, so we bought it when given quite a good discount. I think we still paid about RM900 for this which made this the most expensive seat/chair I've ever bought! Shern was sitting diligently in his Anakku Carrier when he was a few months old. So I thought it would not be an issue when he turns 1 and change to this car seat. After all, I practiced all the right steps in 'starting 'em young'. Shern was placed in his carrier all the time during car rides when he was just a few days old. And at the back of my mind, I was also screaming because we spent nearly a thousand bucks on this seat, man! And also I still believe in the safety of car seat during car ride. So I still did not want to give up so easily. And then just a month or so ago, I started to let Shern seat in this Maxi-Cosi Car Seat, because I believe now that he is bigger, he could understand our explanation. I praised him and told him that he is a big boy now. He was ok sitting in it but initially did not want to buckle up. I started telling him stories and reasoning that buckling up is for his safety. Of course I explained it in a way he would understand. And with that he buckles up now. Whoosh...I thank my lucky stars I taught him Nursery Rhymes! I'm just glad the freaking expensive car seat has not gone to waste! And I really hope The Battle of the Car Seat is over! everytime we go out we need to carry the whole thing and buckle the seat with our seat belts. does yours work that way too? so when u say some has base, it means that they don't have to buckle up the carrier every time? I've read somewhere which says that some carriers have a base and the car seatbelt is strapped around the base, which means that u dont have to "install" it everytime. 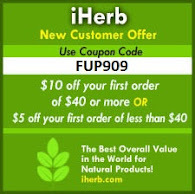 Just click the carrier in place on the base and then just buckle up the baby with the 5-point-harness belt. But mine is like yours. The car seat belt is used to strap the whole carrier, which I find it a nuisance when baby gets bigger. Adoi, infant carrier is different ma. I'm sure price also very different. I think I'm quite lucky to have my kids in car seats all the time, until my eldest turned 4 and hubby gave her the liberty to go w/o but must be buckled up with the car's safety belt. Sometimes when my in laws bring them out, they go w/o the car seat and luckily they are fine when they come back to our car. Wendy, true also. But then there are better carriers than the Anakku one. Wah, u r lucky your kids are like angels on car seats.